Peter Paul Rubens (1577–1640), Marie de' Medici, Queen of France, 1575-1642 (1622), oil on canvas, 130 × 112 cm, Museo Nacional del Prado, Madrid. Wikimedia Commons. I love visiting the Louvre, but there are rooms in which I feel a little lost. 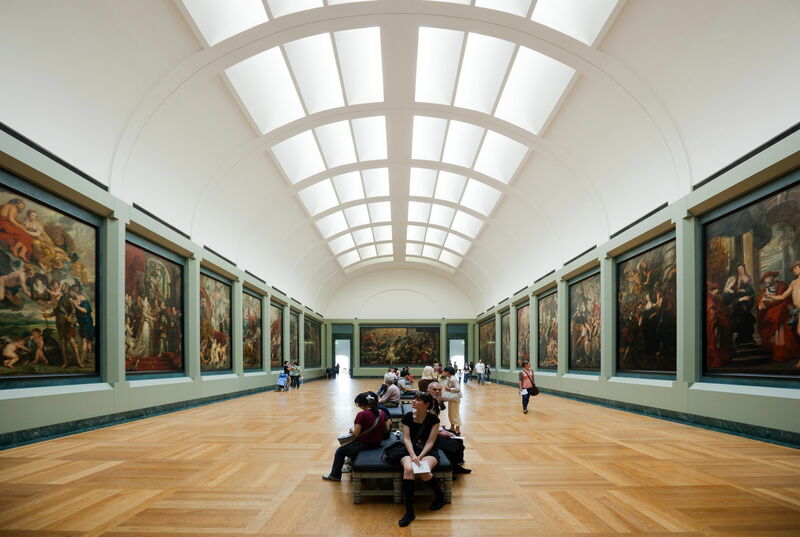 One is the Galerie Médicis, in the Richelieu Wing, where Rubens’ paintings in the Marie de’ Medici Cycle hang. They are huge and wonderful paintings, but cracking the code to their meaning seems so difficult. This article and the next look at one of the stories embedded in those canvases, and how some of the paintings in that grand cycle can be read. Galerie Médicis, Richelieu wing, Palais du Louvre, París. Image by Matt Biddulph (Flickr), via Wikimedia Commons. If you have not looked at them before, this series of twenty-four paintings by Peter Paul Rubens tells the story of Marie de’ Medici, a panegyric to celebrate her achievements first as the wife of King Henry IV of France, following her marriage in 1600, then as the Regent of France following Henry’s assassination in 1610. The series was commissioned by Marie in 1621, to adorn her Luxembourg Palace in Paris for the wedding of Marie’s daughter, Henrietta Maria, to King Charles I of England in 1625. It was a colossal task, and an extraordinary achievement by Rubens and his workshop. Before the paintings in which I am most interested here, Rubens shows Marie’s birth, education, and her marriage by proxy to Henry IV. They later meet, she has a son, who was to become King Louis XIII, and Henry consigns her the Regency before he goes off to war. He is then crowned in the Basilica of Saint-Denis in Paris. Although history has judged King Henry IV (Henry Navarre) to be one of France’s better monarchs, religious fanaticism was his undoing. Several attempts had already been made on his life, and on the day after his queen’s coronation ceremony, 14 May 1610, he was stabbed to death in his coach by a Catholic fanatic. Peter Paul Rubens (1577–1640), The Apotheosis of Henry IV and Homage to Marie de’ Medici (Marie de’ Medici Cycle) (c 1622-25), oil on canvas, 394 x 727 cm, Musée du Louvre, Paris. Wikimedia Commons. 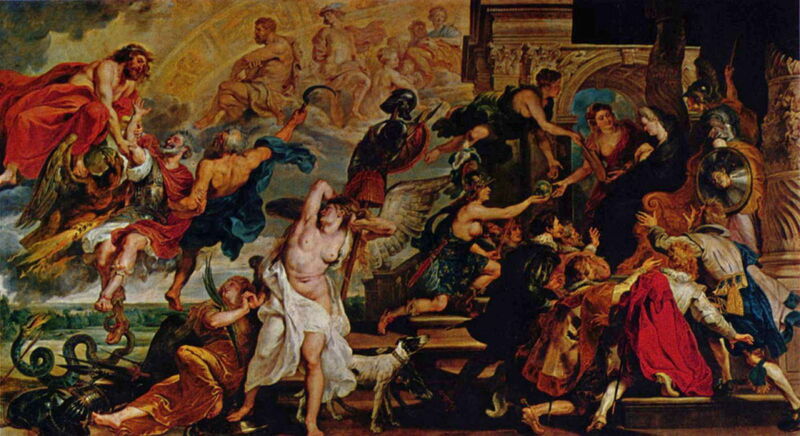 As in the rest of the series, Rubens does not depict a real scene from history, but shows it in allegorical terms, using figures from classical mythology mixed with those from real history. Instead of painting a scene of Henry’s assassination, he made The Apotheosis of Henry IV and Homage to Marie de’ Medici, one of three landscape-format canvases in the series. The left side of the painting shows the assassinated king being welcomed into heaven as a victor by the gods Jupiter and Saturn. Jupiter, as king of the Olympian gods, is Henry’s divine counterpart; Saturn, holding a sickle in his right hand, marks the end of Henry’s earthly existence. Below them is Bellona, an ancient Roman goddess of war, who is stripped of her armour and appears tormented. On the right side, Marie is seated on her throne as Regent, wearing black widow’s weeds, as the personification of France kneels in homage and presents her with an orb of office. Behind the Regent, at the far right, is Minerva bearing her Aegis, the shield emblazoned with the image of Medusa’s head. Also present are Prudence and Divine Providence, and her court are paying tribute from below. Peter Paul Rubens (1577–1640), Marie de’ Medici, Queen of France, 1575-1642 (1622), oil on canvas, 130 × 112 cm, Museo Nacional del Prado, Madrid. Wikimedia Commons. 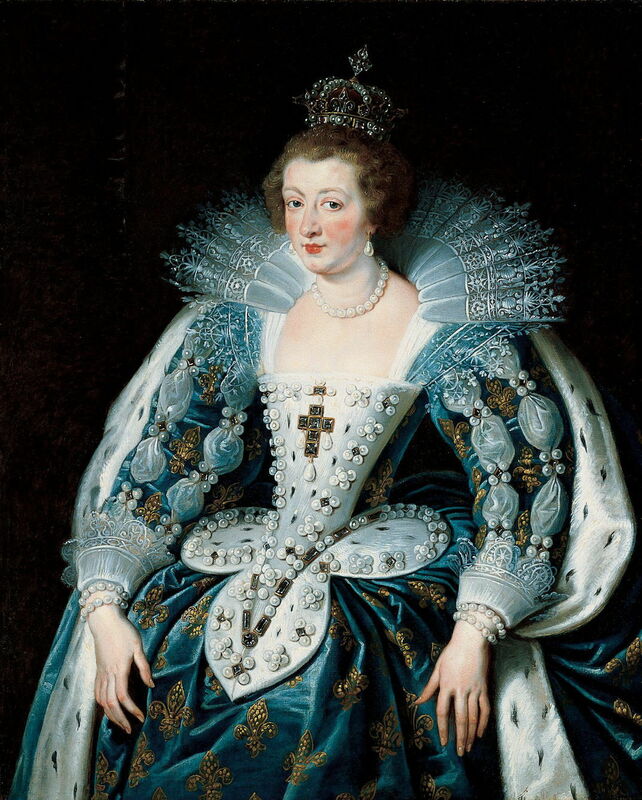 When Marie de’ Medici, Queen of France, 1575-1642 (1622) became Regent, she had next to no experience or even interest in politics or government. She has since been characterised as “stubborn and of limited intellect” who was under the influence of her maid. She was desperate to form a strong alliance with Habsburg Spain, which she felt would lead to more permanent peace within Europe. 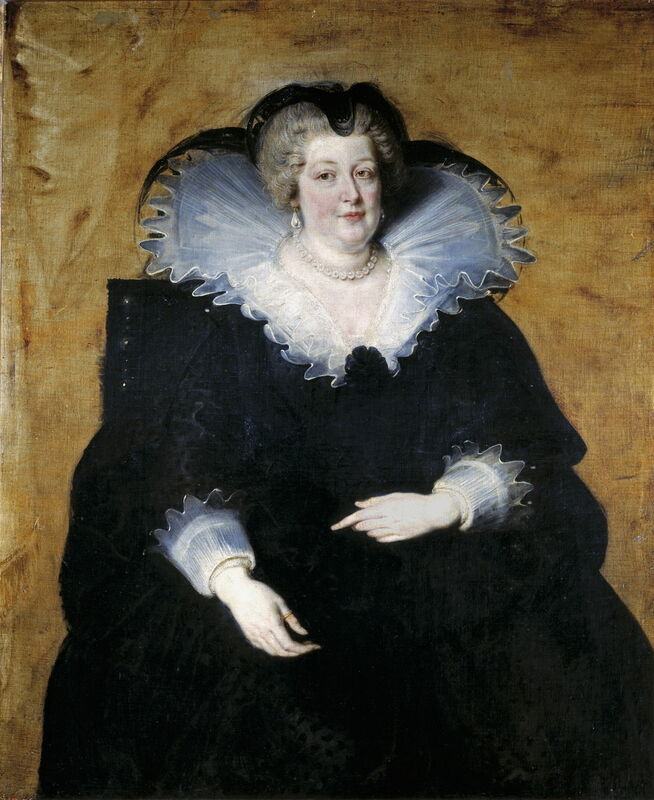 It was she who appointed Armand Jean de Plessis to her councils: he later became Cardinal Richelieu, whose name is given to the wing of the Louvre in which Rubens’ series is exhibited. Peter Paul Rubens (1577–1640), The Council of the Gods (Marie de’ Medici Cycle) (c 1622-25), oil on canvas, 394 × 727 cm, Musée du Louvre, Paris. Wikimedia Commons. Rubens very tactfully shows Marie’s planning in the form of The Council of the Gods, another in landscape format, and one of the most complex paintings in the series, which remains hard to interpret. In the foreground centre are Athena (helmeted and in armour, with her Aegis) and Apollo (with his bow). They are chasing off the figures at the lower right, consisting of Discord, Hate, Fury, and Envy. 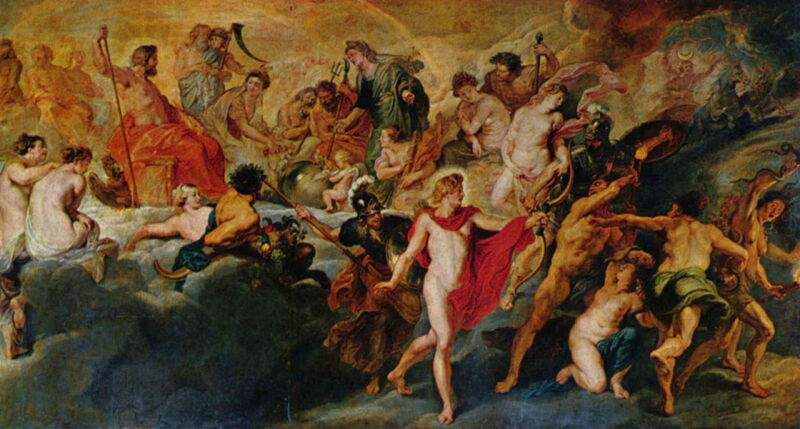 In the upper right, Jupiter debates with a group of gods and goddesses, including Saturn (with his scythe), Diana, Neptune, and a woman wearing green over black mourning dress, who can only be Marie, but is holding Mercury’s caduceus. Other figures recognised include Pluto, Pan, Flora, Hebe, Venus, Mars, and Juno. Whatever divine advice Marie may or may not have received, she decided that the best way to secure peace was through marriage. Not one wedding, but two: Anne of Austria to her son Louis XIII of France, and his younger sister Princess Élisabeth to the future king of Spain, Philip IV. Peter Paul Rubens (1577–1640), Portrait of Anne of Austria, Queen of France, 1601-1666 (c 1622-25), oil on canvas, 120 × 96.8 cm, Norton Simon Museum, Pasadena, CA. Wikimedia Commons. Rubens’ Portrait of Anne of Austria, Queen of France, 1601-1666 (c 1622-25) shows Marie’s intended future Queen of France. The eldest daughter of King Philip III of Spain and Margaret of Austria, she was the Infanta of Spain and Portugal, and Archduchess of Austria. Despite her name (the result of her royal House), she had been born in Spain and raised there, in Madrid. 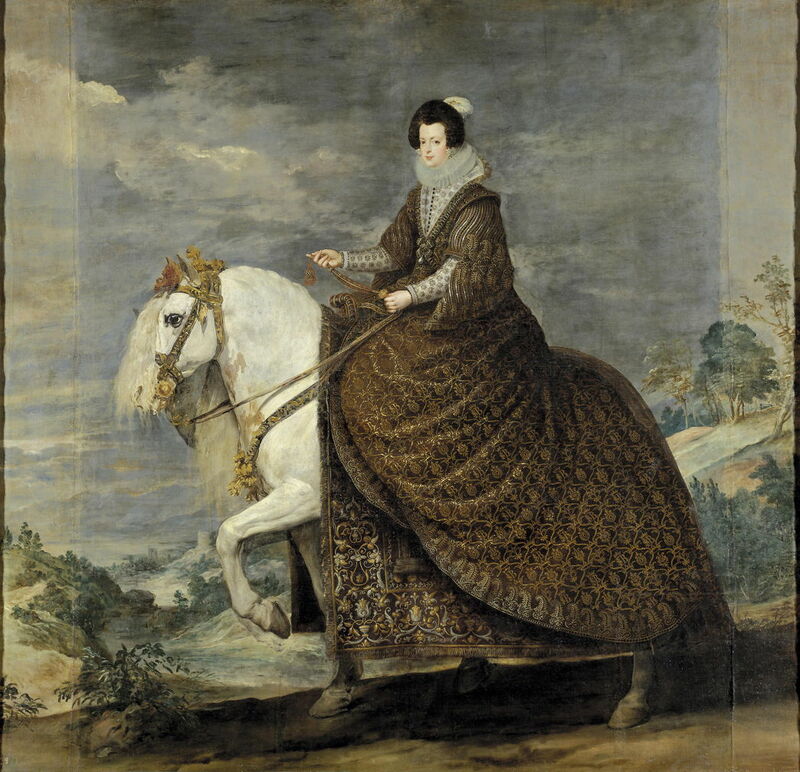 Diego Velázquez (1599–1660), Equestrian Portrait of Élisabeth of France (c 1635), oil on canvas, 301 x 314 cm, Museo Nacional del Prado, Madrid. Wikimedia Commons. Diego Velázquez’ Equestrian Portrait of Élisabeth of France (c 1635) shows Marie’s eldest daughter a decade after the marriages. Born in 1602, she was soon betrothed to the Prince of Piedmont, who was expected to succeed his father as Duke of Savoy. However, he died young, and in any case Marie was not interested in securing peace with Savoy. Élisabeth was born in the Palace of Fontainebleau in France, and lived away from the main court in the Château de Saint-Germain-en-Laye. Two years after she had become Regent of France, Marie successfully negotiated both betrothals. Wikipedia on the whole cycle. Posted in General, Language, Life, Painting and tagged France, Louvre, Marie de' Medici, Medici, narrative, painting, Rubens, Spain, Velázquez. Bookmark the permalink.